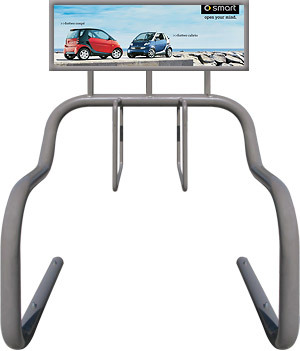 Street Media uses a proven design referred to as a “hanger” rack favoured by the cycling community as the most functional and security competent rack. Constructed from Schedule 40 (or better) steel for durability. We also label each rack with a serial number for identification and inventory control. Our racks are available in a variety of different configurations to meet your Shopping Centre's traffic needs. 2, 3, 4 and 7 hanger models are available in different colors to match your brand and color scheme. We use Premium Outdoor UV powder coating. Different materials such as Stainless Steel, Galvanized, Powder Coating are also available to match your existing furniture.